Ciaran Hanks. Photo: Rebecca Cresta © MS Society. A MELKSHAM lad has won a national charity award in recognition for his fundraising efforts for the MS Society. 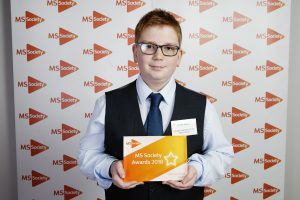 Twelve-year-old Ciaran Hanks was one of three young fundraisers to be crowned a winner of the MS Society’s 2018 Young Fundraiser award at an awards ceremony held in London last month. Ciaran raised hundreds of pounds for the charity last year by swimming the equivalent length of Loch Ness, 1,454 lengths of a 25m pool. He then went on to swim the equivalent length of the River Thames, raising even more money and awareness of MS. He was joined in his fundraising by British Paralympian swimmer, Stephanie Millward, and by members of Melksham Town FC. Ciaran said, “I’m proud because it’s taken a lot of energy. It means a lot to me because I did this challenge as a thank you to Stephanie Millward for inspiring me. It’s been amazing meeting so many people today, including the other young fundraisers. It feels really good to be recognised in this way. Michelle Mitchell, chief executive of the MS Society said, “The MS Society Awards is our way of celebrating the remarkable hard work and dedication of those who make a difference to the 100,000 people living with MS in the UK. Find out more about the MS Society at www.mssociety. org.uk. Photo: Rebecca Cresta © MS Society.